This is absolutely, hands down, one of the most amazing things I have ever made. Pinterest led me to this annie’s eats recipe, and it really was very easy to make, too. It’s just scrumptious. I used milk chocolate morsels instead of semi-sweet. 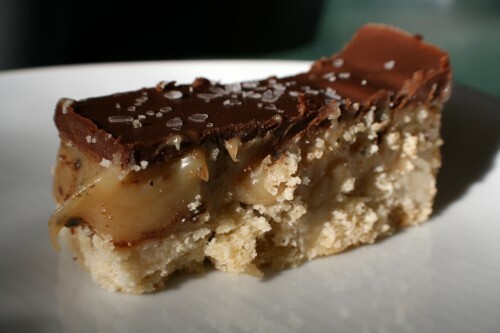 Warning: This dessert is extremely sweet… take heed if you have an unfilled cavity or if you do not have any milk around. My picture is not as nice and clean as hers.. but it sure does taste good. This entry was posted on March 14, 2012. It was filed under Baking.